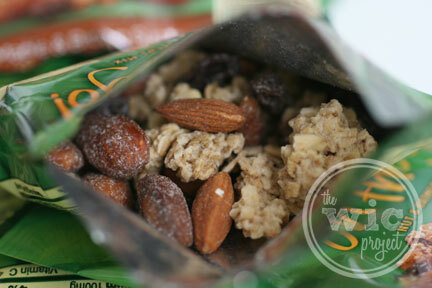 A few months ago, we introduced you to a (then) new product from Emerald Nuts – their convenient Breakfast on the go! Nut & Granola blends. These are convenient, pre-portioned packets filled with nutty, dried fruit, granola goodness that help you kick start your day in under 200 calories. Now, they’ve expanded their Breakfast on the go! line with the introduction of their new Oatmeal blends. Eating whole grains, like oatmeal, has been shown to help keep weight off, but oatmeal is difficult to eat on the go and in a hurry. Emerald ® Breakfast on the go!™ provides the benefits of oatmeal but in a pouch, making it easier to carry and eat, perfect for those busy dieters. The new Breakfast on the go! Oatmeal blends come in three new flavors – Maple & Brown Sugar, Apples & Cinnamon, and Blueberries & Creme. Each 1.5 ounce pouch contains a yummy blend of oatmeal clusters and other delectable goodies, such as raisins, roasted almonds, or dried fruit. While packed with flavor, each serving has 3 grams of dietary fiber and 3-4 grams of protein, while still being 200 calories or less per pouch. 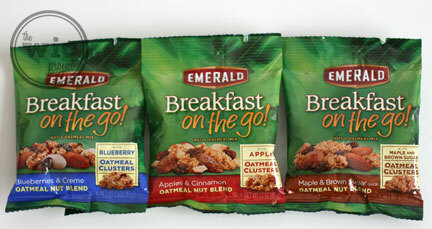 I was really impressed with how filling each packet of Emerald Breakfast on the go! was for breakfast. It was just enough to satisfy my hunger but wasn’t heavy and didn’t make me feel like “ooph, I ate too much.” The oatmeal clusters are convenient bite sizes and I loved the flavors. If I had to choose, I’d say the Maple & Brown Sugar was my favorite of the three (although all of them are sure to please.) You could really taste the brown sugar sweetness blended with the maple flavor. As I mentioned in my previous review, these are a great option for a quick breakfast if you’re running out the door to catch the train, or bus, or if you’re just not up for preparing anything. They have a lot of flavor and can keep you going through the morning. They’re also super convenient snacking options since they’re in individual pouches. They really come in handy for afternoon snacks at home, or even as a healthy snack alternative for the kids at school. Speaking of school, these new flavors, as well as the other Breakfast on the go! flavors are part of the Labels for Education program. To pick-up the new Emerald breakfast on the go! Oatmeal blends, check your local grocery story. Make sure you download this coupon for $1.00 off Emerald Breakfast on the go! before you head into the store. You can also purchase Emerald Breakfast on the go! online through Amazon. Download a coupon for $1.00 off Emerald Breakfast on the go! Buy Emerald Breakfast on the go! Maple & Brown Sugar sounds so good! Maple and Brown Sugar would be my first choice! I’d love to try the Berry Nut Blend the most! Blueberries and cream sounds good! Maple and brown sugar definitely! Apples & Cinnamon for me, please! Thanks. Blueberries and Cream sounds awesome! Maple and Brown Sugar sounds the best to me! I would like to try their Apples & Cinnamon flavor! I would love to try blueberries and cream. I would love to try blueberries and creme. I would love to try blueberries & creme. I would like to try maple and brown sugar. Maple and brown sugar would be the bomb! I would like to try the maple and brown sugar first. Maple and Brown sugar sounds good! Love to try the Apples & Cinnamon. Thank you for the chance to win! Would love to try the Apples & Cinnamon. Thank you for the chance to win! Maple brown Sugar!!! That sounds really good! Definitely Maple & Brown Sugar! Apples and Cinnamon! One of my favorite flavor combos. Maple and Brown Suger sound good! Maple and Brown sugar for sure! Blueberries and cream are always a favorite combo! I want to try Apples & Cinnamon! I sure would like the Apples and Cinnamon! I would like to try the Maple and Brown sugar. I’d love to try the Apples and Cinnamon. They all look good but I most want to try Apples & Cinnamon! I’d like to try Blueberries and cream. I would love to try the maple brown sugar! Apples & Cinnamon sounds great! Apples and Cinnemon is my choice!! Maple and brown sugar … yum! Definitely the Blueberry Oatmeal Clusters 😀 Thanks! I would like to try Apples & Cinnamon! I go for this flavor – Blueberries & Creme. The blueberrys and cream sounds really good! I would love to try the Maple and Brown Sugar. Maple & Brown Sugar looks good. Blueberries and Creme sounds yummy! I’d like to try the apple cinnamon. Thanks for the chance. Maple and Brown Sugar is my fave! Would love to try the Blueberries & Creme. I would really like the maple and brown sugar. I’d like to try the Maple & Brown Sugar. I want to try the Blueberries and Creme. I want to try the maple and brown sugar mix the most. I would love to try the brown sugar and maple! Maple & Brown Sugar looks so yum. Thanks. I love fruity things, but Maple and Brown Sugar sounds the best. The Maple & Brown Sugar sounds yummy! I would like to try the Apples & Cinnamon blend. I would like maple and brown sugar. 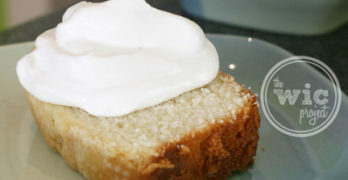 I would love to try the Maple and Brown Sugar! I would LOVE to try the Blueberries and creme! Thanks! Apples and Cinnamon would be my flavor of choice! I like the maple and brown sugar. I would love to try the Apples & Cinnamon. I would like to try them all. they sound good. I want to try the Maple & Brown Sugar variety. I want to try blueberries and cream. Thanks for the giveaway. I would love to try the Apples & Cinnamon type, sounds delish!!! The Maple & Brown Sugar. Maple and brown Sugar sounds great, but they all sound good. I want to try the Apples and Cinnamon most. Apples & Cinnamon sounds great. Maple and Brown Sugar, which happens to be my favorite oatmeal flavor! id like to try the Maple and Brown Sugar/. I want to try Apples & Cinnamon.